How often do you see a PATCH of 4 leaf clovers? In line with Vince Lombardi's quote yesterday, this quote is about work. People make their own luck through making opportunities and working hard. Again, it isn't knowledge, or skill that creates success, but the work that get's it done! 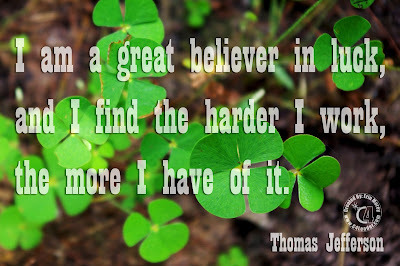 Please take the time to go out and try your luck, because you won't find your 4 leaf clover sitting around. Quick change in subject. Do you like these picture quotes on Thursday, or is there another day you would prefer? I am starting to lean towards Monday, as a way to kick-off the week. What do you think?